Heat butter in a pan. When melt add flour. Stir well. Cook for about a minute on low flame. Add garlic, basil, white pepper and salt. Cook for a while. Remove from flame. Steam all the veges with little salt. 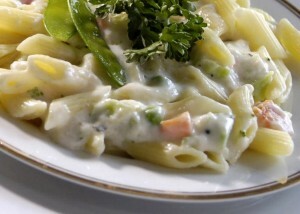 Mix Sauce & Veges.Add Penne. Adjust Seasonings. 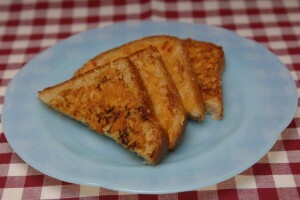 Garnish with Parseley , Cheese & Enjoy Hot !. Serve these all-in-one parathas to your little ones for lunch and be ensured of their calcium, caloric, protein and iron intake. Cooking Time : 40 mins. 1. Combine all the ingredients and knead into a soft dough using enough water. 2. Divide the dough into 4 equal portions. 3. Roll out each portion into a 200 mm. (8″) diameter circle. 4. 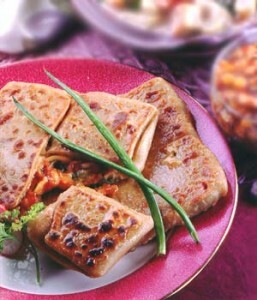 Cook each chapati lightly on both sides on a hot tava (griddle) and keep aside. 1. Drain the kidney beans, add 2 cups of water and pressure cook for 4 to 5 whistles till the rajma is overcooked. You should be able to mash the rajma with your fingers. 2. Drain any excess liquid and discard. 3. Heat the oil in a non-stick pan, add the onions, ginger and garlic and sauté till the onions are light brown in colour. 4. Add the tomatoes, turmeric powder, chilli powder, coriander powder and salt and cook till the oil separates. 5. Add the cooked rajma and mix well. 6. Add the curds and continue cooking till the mixture is dry. 7. Add the coriander and mix well. Keep aside to cool slightly. Divide into 4 equal portions. 1. Place one chapati on a dry surface and spread one portion of the rajma filing in the centre of the chapati. 2. Sprinkle some spring onions and 1 tablespoon of cheese. 3. Bring in all sides of the chapati towards the centre to enclose the filling and make a square paratha. 4. Seal the edges with a little water. 5. Repeat to make 3 more parathas. 6. Cook on both sides, using a little oil till the parathas are golden brown.